Dunham-Bush has introduced two new ranges of fan convectors specifically for establishments, where safety, efficiency and siting versatility are key requirements. The new robust, SL Slimline range of fan convectors are designed to provide a neat and aesthetically pleasing solution, where space is limited, fitting neatly into areas where conventional units prove difficult, if not impossible, to install. 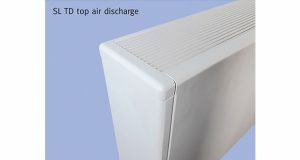 They come with either a top air discharge (SLTD) or a front discharge (SLFD), a standard height of 550mm and a range of lengths from 700 to 1500mm. Depth of all models is a standard 170mm. Both models feature extruded aluminium discharge grilles and punched steel bottom entry inlet grilles. Models have two coil options, with nominal heat outputs ranging from 2.5kW to 9.0kW, based on LTHW 80/70°C, ambient air 18°C. The SL fan convector also has the option of EC motors, which increase the electrical efficiency by over 80% and enable infinitely variable fan speed control, from zero to maximum. The new Smart-Vector has been developed to provide an effective solution for installation in classrooms, particularly when Building Bulletin 101 is a requirement. Smart-Vector helps to deliver the highest standards of air quality, essential for the well-being and productivity of the occupants. The Smart-Vector range comprises four models in nominal outputs from 1.4 to 13.6kW and four casing sizes, ranging from 689mm to 1495mm wide. Nominal outputs are based on LTHW 80/70°C flow and return temperatures and an 18°C ‘air on’ temperature using a WA2 coil. Alternative operating conditions and coils are available. Each unit incorporates an infinitely variable fan speed motor, a modulating mixing damper, and a 2-port or 3-port control valve, all controlled by 0-10V dc control signals. In addition, each unit has a frost protection override thermostat as standard. The basic control option comprises a wall-mounted controller, which measures temperature and CO2 concentrations and controls the mixing damper and control valve actuators accordingly. It also controls the fan speed, whether in manual or automatic modes. The controller also has an RS485 communication port to allow it to interface with a BACnet BMS system where required, thus allowing time scheduling, set point changes, interrogation and integration with other H&V plant. Other BMS protocols and controllers are available upon request and these may include Modbus, fitting ‘free issue’ controllers, leaving air sensors, fan failure monitoring and ‘spring return’ actuators. • Standard colours RAL 9010 30% gloss. For further information please visit www.dunham-bush.co.uk, E: info@dunham-bush.co.uk or call 023 9247 7700. Next: Nominate Your Next Unsung Hero of Care!